My youngest daughter is from Fuling, China. 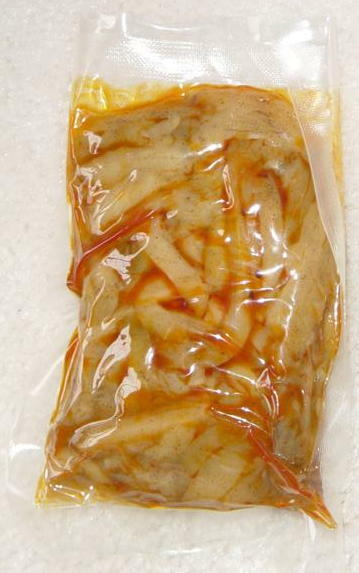 The city is famous for Zhacai, a pickled mustard tuber. Evidently many Chinese know the local manufacturer’s commercial jingle. While we were at the orphanage this past March, the director gave us a gift box of the delicacy. The box was quite decorative–it looked like a box for fine chocolates–but since I cannot read Chinese, we took the director’s word of its contents and never opened it when we were over there. Last week, my wife sorted out the souvenirs of the trip and finally opened the shiny green box. It contained six small vacuum-sealed pouches, each with a sticker (in Chinese of course) indicating its flavor. In a word, it looked: peculiar. But my wife had a gleam in her eye. She would save it for a party hosted by one of our fellow adoptive parents. Chinese new year was around the corner and the hosts’ daughter, our oldest daughter, and a third family’s daughter, all Chinese, had January birthdays. My wife thought it would be a hoot if the husbands (not the wives) would sample the food stuff. So at the party, after the lasagna but before the German chocolate cake, my wife cut open a pouch and squeezed it out on a plate. Dig in guys. With a diet coke and napkin at the ready in my left hand, I stabbed some Zhacai with a fork. It had the consistency of fat, overcooked bean sprouts and the approximate taste of saurkraut. A little spicier, thinker, very limp and cold. My wife chose not to splurge on 20 seconds in the microwave. While no one joined me when I took a larger second bite, we still have five pouches left if anyone is interested.